We discussed about custom repo setup on Termux. We will actually see that application here. In this Guide, We Will Discuss How To Run Jupyter Notebook on Android Using Termux CLI. It is no way closest to real stable way, you may need to modify, develop, contribute to make it smooth. The total method is time taking, may throw error demanding searching fix. It is recommended to use an USB mouse or keyboard with Android to work. It is practically from official guide after testing. It is very easy to get errors in red font. 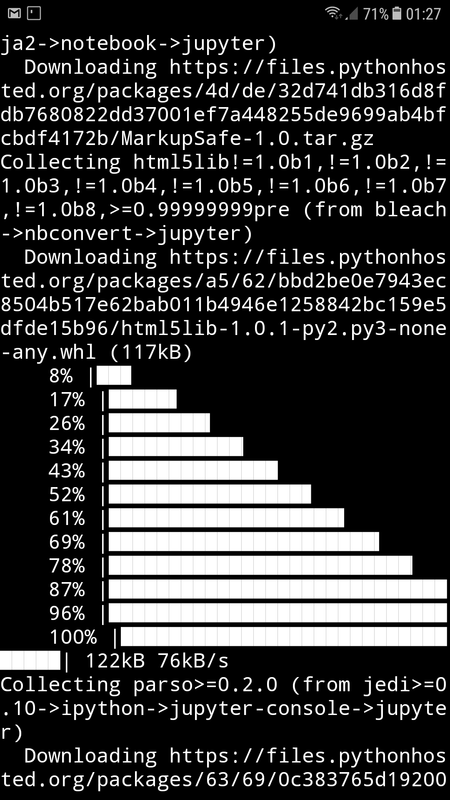 Then you can run Jupyter notebook in Termux like you do on full computer. You will get informative screen and link after running command. It feels like 7 years back. This Article Has Been Shared 1274 Times! Zeppelin Can Be Pre-Built Package Or Can Be Build From Source. Here Is How To Install Apache Zeppelin On Ubuntu 16.04 Building From Source. This article Theoretical Foundations of Big Data aims to provide an overview of theoretical models of the data analysis and administration. RabbitMQ is a Message Broker for the Messaging Protocols. Here Are the Steps on How To Install RabbitMQ on Ubuntu 16.04 LTS Server Over SSH. Cite this article as: Abhishek Ghosh, "How To Run Jupyter Notebook on Android (Termux CLI)," in The Customize Windows, May 1, 2018, April 23, 2019, https://thecustomizewindows.com/2018/05/how-to-run-jupyter-notebook-on-android-termux-cli/.